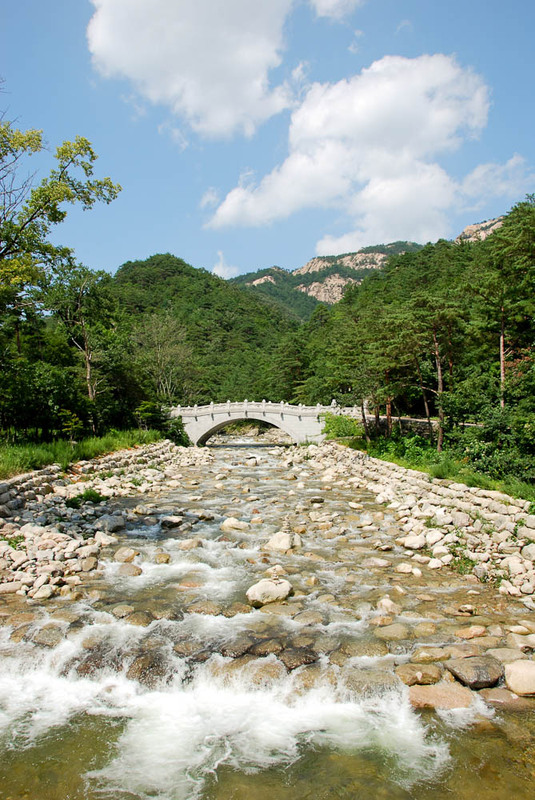 Seoraksan is one of Korea’s most popular parks and it’s easy to see why. 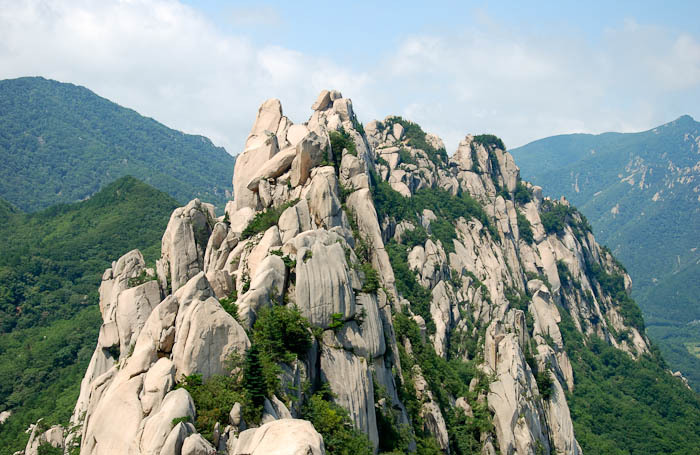 Its impressive crags are among the tallest in the country and the lush valleys are beautiful year-round. 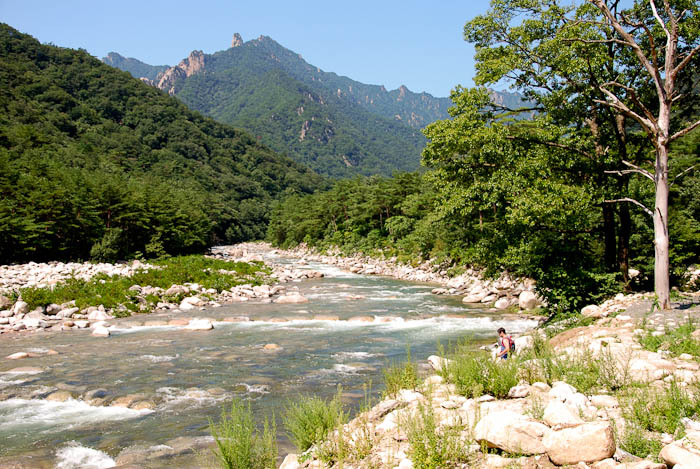 Located just 20 km west of Sokcho, Outer Seorak is really easy to get to by bus. There was a stop right outside the guesthouse David and I were staying in, and it only took about 30 minutes to get to the park entrance. Thankfully, after a few days of solid rain, we woke up to the sun shining and a brilliantly blue sky which made for an extremely beautiful day. We decided to hike the popular Ulsanbawi trail because we heard the view from the top, especially on a clear day, was simply amazing. It certainly proved to be and the hike wasn’t too difficult. 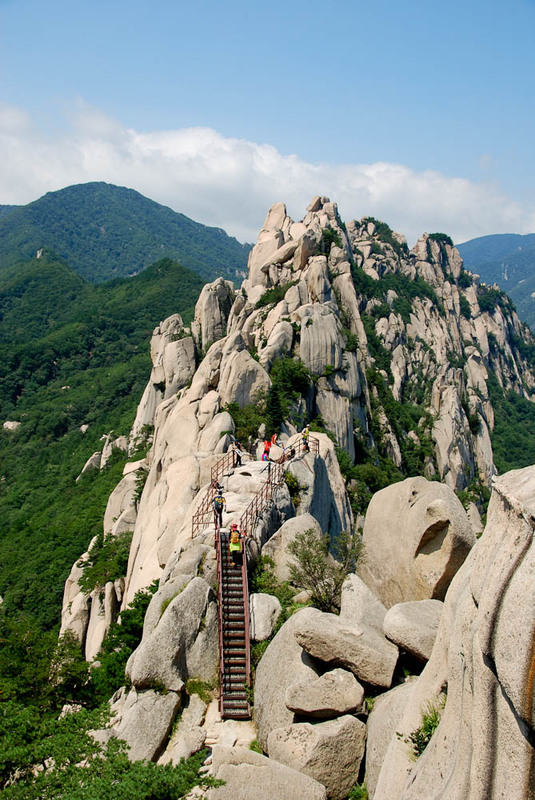 The ascent was gentle until the last few kilometers, followed by about 800 stairs leading to a breathtaking view. If we hadn’t had so many things on our to-do list during our two week trip, I think we would have spent a few more days exploring the rest of the park. Perhaps I’ll make it back to witness the red, orange and gold bursts of color that cover the park in the fall. 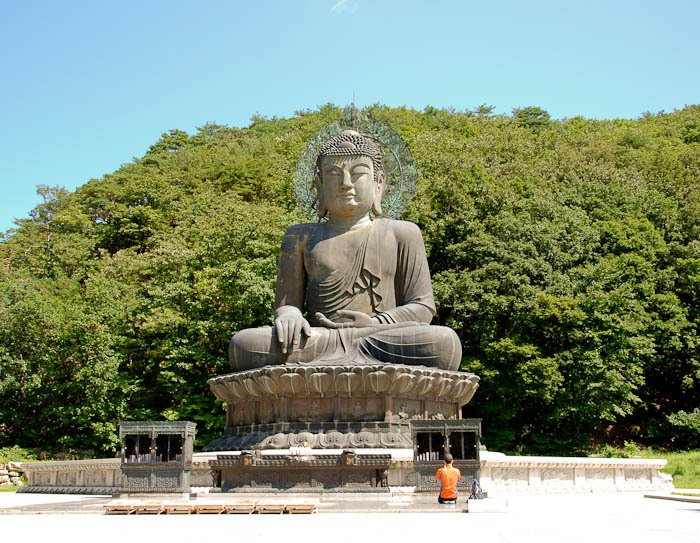 Giant Buddha near the park entrance in Outer Seorak. David, testing the water at Seoraksan. 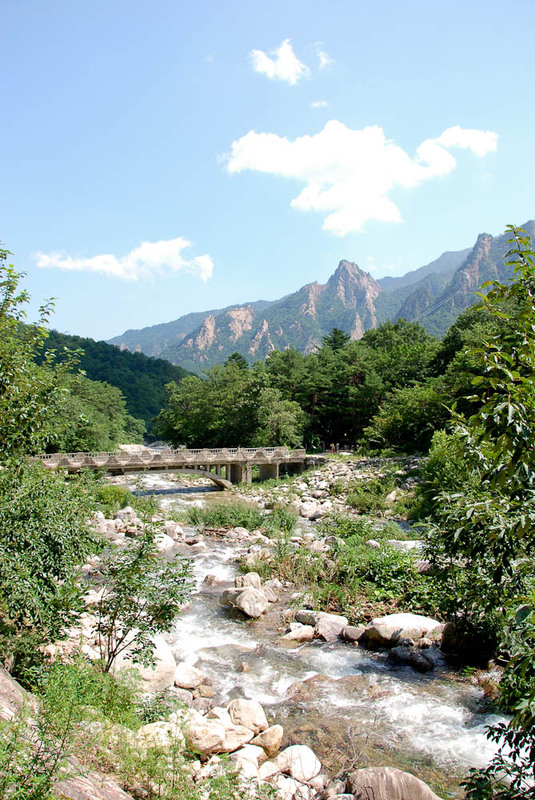 We couldn’t have asked for a better day to explore Seoraksan. 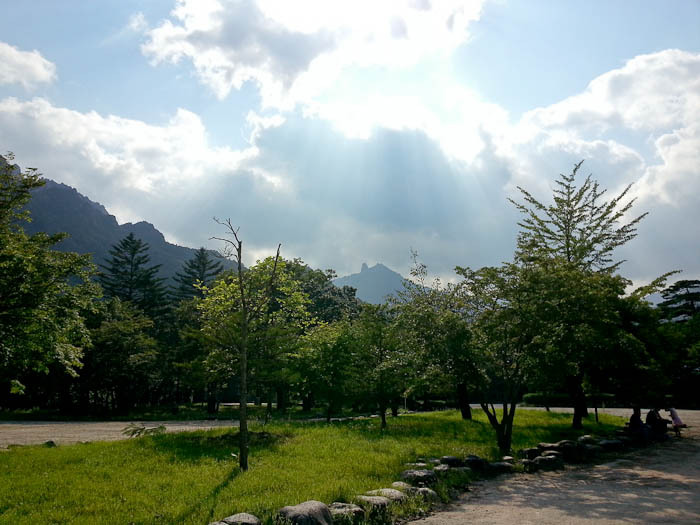 With July and August being the rainy season in Korea, we were lucky to have such beautiful weather. 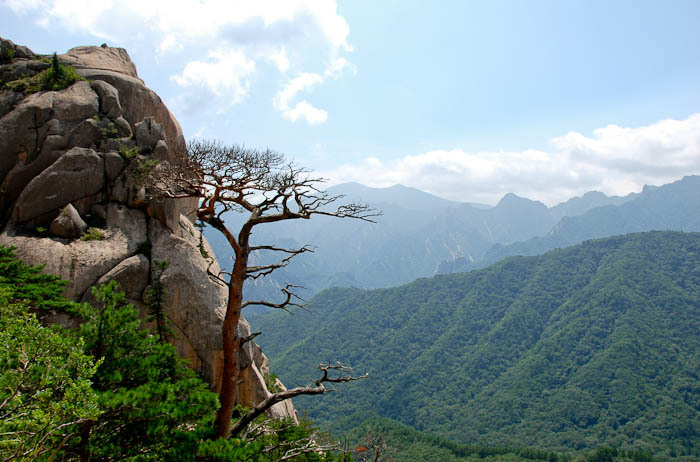 Seoraksan National Park, somewhere on the Ulsanbawi route. The granite peaks of Ulsanbawi. 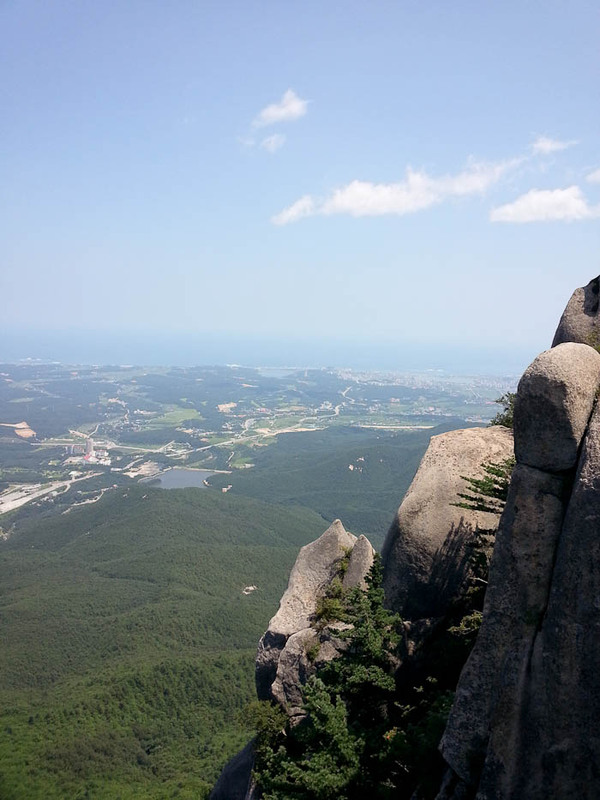 View of Sokcho and the East Sea. We made it up the 800 stairs! 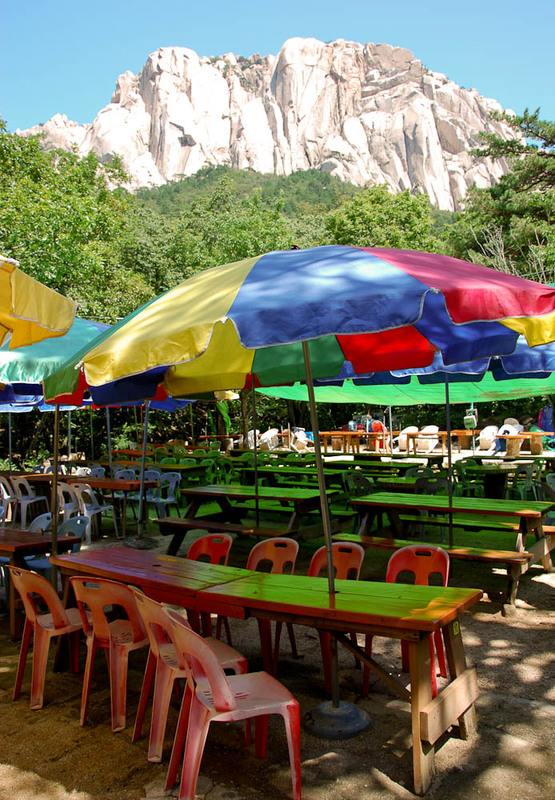 There are snack bars and places to eat along many of the hiking trails in Korea. They seem to appear out of nowhere and I keep wondering how they haul all the supplies and equipment up the steep, narrow trails. 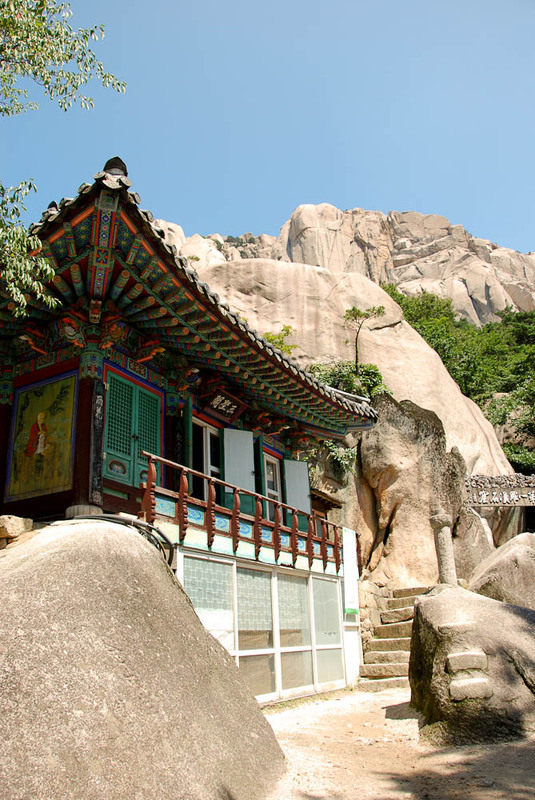 Sinheungsa Temple nestled on the mountainside in Seoraksan National Park. 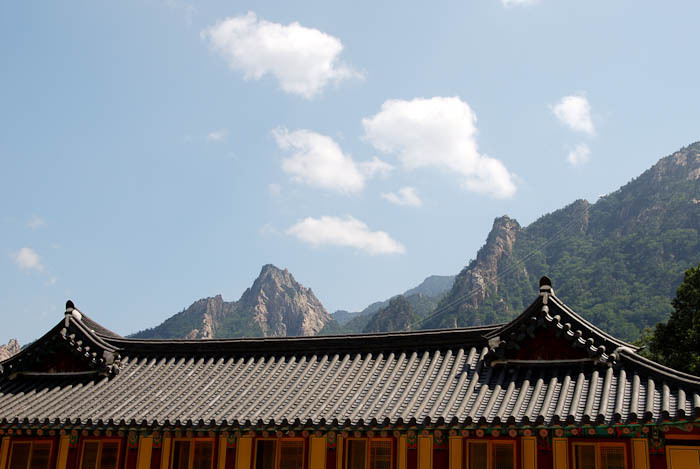 Korean rooftops and craggy peaks. We enjoyed haemul pajeon (a savory pancake with seafood and green onions) and makgeolli after the hike, both of which are popular “snacks” sold near hiking trails. 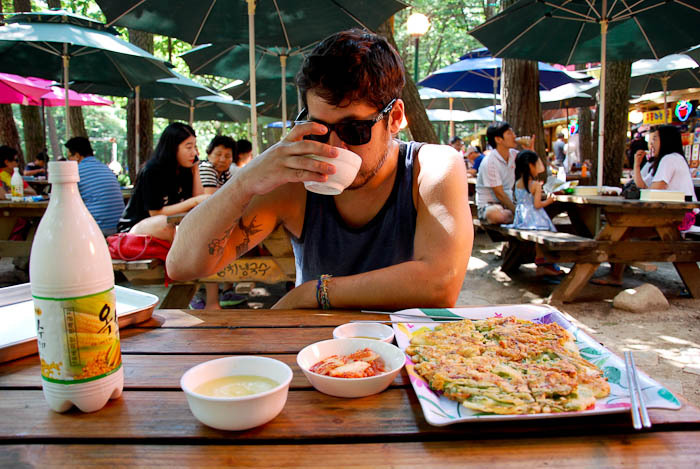 Makgeolli is a traditional Korean alcoholic beverage made from rice and is typically served in bowls. Nice pictures and post Em! 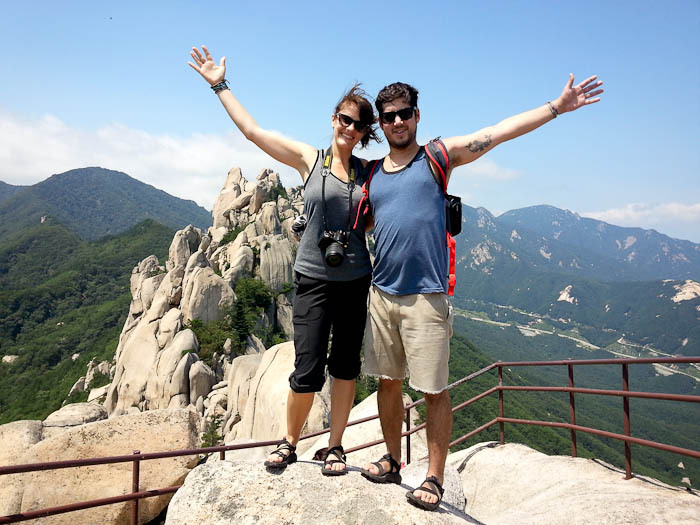 I really enjoy reading and looking at the pictures of your adventures in South Korea. Keep up the good work! Wow, that park looks amazing! One of my favorite spots in all of Korea. I did that same hike! Anyway, you guys did it in sandals, and I almost had a heart attack on the way up! Great photos and nice write up! Beautiful! Would be great to see in the fall.